The Endosurgery Unit offers a Fellowship Council-accredited, one-year clinical fellowship that focuses on advanced foregut operations, bariatric surgery, hernia surgery, robotic surgery, endoscopic and/or endoluminal procedures, and other advanced laparoscopic applications (solid organ, colorectal). The bulk of the fellows' clinical rotations are spent at Emory University Hospital and Emory University Hospital Midtown, and it is anticipated that rotations will expand to Emory Saint Joseph's Hospital. Fellows learn to perform as both operating surgeons and teaching assistants and may also receive temporary staff appointments with limited roles as attending surgeons. Emory Surgery began regularly placing in the top 20 of all departments of surgery nationwide in annual NIH funding in FY2008. 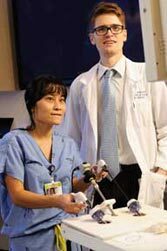 According to ranking tables of annual NIH funding posted online by the Blue Ridge Institute for Medical Research (BRIMR) in February 2019, Emory Surgery placed 7th in NIH awards in FY2018.Transplant immunologists Christian Larsen, Andrew Adams, Mandy Ford, and I. Raul Badell; novel cancer imaging and targeted therapeutic agents specialist Lily Yang; health services researcher Rachel Patzer; cardiovascular biomechanics and treatment technologies investigator Muralidhar Padala; basic science, cardioprotection researcher John Calvert; sepsis and shock scientist Craig Coopersmith; and vascular disease researcher Luke Brewster placed high in the NIH's listings of funded department of surgery-based principal investigators. Beyond the NIH, the Department's investigators receive grants from such entities as the Agency for Healthcare Research and Quality, AVON Foundation, Carlos and Marguerite Mason Trust, Georgia Research Alliance, American Heart Association, CDC, FDA, Bill and Melinda Gates Foundation, and the Department of Defense. Regardless of ultimate career paths, research participation offers yet another valuable avenue for fellows to work closely with our faculty, contributes to developing the investigational dexterity that is vital for a career in academic surgery, and facilitates adept decision making in clinical practice. Past endosurgery fellows have presented their investigations at national meetings and been lead authors for accompanying papers and/or book chapters on foregut physiology, colon disease, endoscopy, liver surgery, resident education, hernia surgery, inflammatory mediators, diabetes, and obesity metabolism. International scholars can be considered on a case by case basis and are most commonly accepted as research appointments. Surgeons who have completed training outside the U.S. and Canada are required to submit requests to Dr. S. Scott Davis, director of the Endosurgery Unit. Final acceptance is also contingent upon documentation of independent funding, completion of ECFMG requirements, fluency in spoken and written English, visa approval, and a temporary training license for the State of Georgia. Prospective fellows should apply to the program through the Fellowship Council by September 1st. Interviews are often scheduled at Emory in October and November. To complete the credentialing and privileges process, approved applicants must attain medical licensure in the State of Georgia at least six months in advance of their fellowship. For more information, please contact Dr. Edward Lin, the associate program director of the fellowship, at elin2@emory.edu or 404.712.2196. Dr. Lin oversees the day-to-day aspects of the fellows' clinical, academic, and research activities.